10. Kepler's Laws Venus is the brightest planet in the sky and played an important role in the calendar of the ancient Maya of Yucatan. The first astronomer to use the telescope was Galileo in 1609, and he observed Venus throughout 1610. He noted how it changed from a small near-circle (when on the far side of its orbit) to a larger semicircle of light and then a crescent (see image below) which steadily grew narrower and larger. That seemed convincing evidence: Venus orbited the Sun and reflected its light, undergoing changes like the phases of our own Moon. Much better telescopes followed, but unlike the Moon, Venus showed no surface markings. It seemed to be a bland sphere, like a planet covered by thick clouds. Space probes finally recorded the real structure of those clouds, using ultra-violet wavelengths absorbed by the atmosphere. In size the planet was just a little smaller than Earth, and it orbits the Sun in 224.7 days. 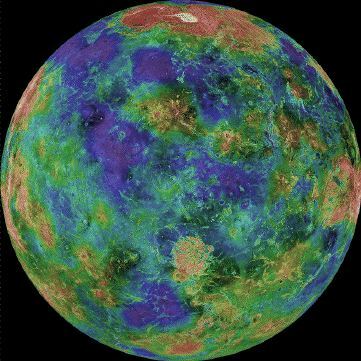 For all these reasons, the rotation of Venus remained a mystery for many years, though Doppler shift measurements suggested any rotation was very slow. Then in the 1970s, radars from the big radio astronomy dishes at Arecibo and Goldstone managed to obtain reflections from the ground, identifying features still known as "alpha" and "beta" (highland areas) and one named "Maxwell" which turned out to be a mountain ("Maxwell Mons"). The radars also derived the distance of Venus, giving a better estimate of the astronomical unit, a problem for which Edmond Halley (nearly 3 centuries earlier) proposed using the transit of Venus in front of the disk of the Sun. Since the features did not seem to shift much during the observation, radio observers waited for the next closest approach (with Earth and Venus in a completely different position in their orbits), to see how far Venus had rotated in the intervening year and a half. They found to their surprise the features had undergone no observable shift. For some unknown reason, the rotation of Venus (slow and retrograde) seems locked to always face Earth the same way during each closest approach. Only time will tell whether this is mere coincidence or an actual effect. The space probe Mariner 2 in 1962 conducted the first successful flight past Venus and its instruments showed an extremely thick atmosphere (pressure on the ground 92-93 atmospheres), mostly carbon dioxide plus a little nitrogen. Because Venus is closer to the Sun, and because carbon dioxide hinders the return of absorbed heat to space ("the greenhouse effect"), the surface is rather hot, about 735° K (462° C). No planetary magnetic field was observed, though the solar wind hitting the upper atmosphere creates a long wake. The Soviet Union sent 16 spacecraft in the "Venera" series (the Russian name of Venus)--some landers, some orbiters and some which failed. Shown here are images of the Venus landscape from the Russian probe Venera 14--taken through a wide-angle lens which makes horizon curve. Several space missions have visited Venus since then. Pioneer-Venus orbited the planet 1978-92 and studied its atmosphere, also dropping small probes into it. The Soviet "Galley" spacecraft in 1985, on its way to Comet Halley (Russian has no "H", so "Halley" was spelled that way) dropped balloons into it, each helping track high altitude winds (at altitudes around 50-55 km) for two days. Even the Messenger spacecraft passed it twice--not to explore the planet, but to use it to give up velocity and thus approach Mercury without excessive speed. The European Venus Express" is orbiting the planet since April 2006, in a very eccentric 24-hour polar orbit reaching down to an altitude of 250 kilometers. The surface itself was mapped in great detail by the Magellan mission in 1989-94, using a radar altimeter. From that a detailed contour map of the surface was derived(shown on the right, color coded--for a larger version, click here). Many interesting features emerged--some volcanic, some the results of big impacts (but no small craters--small impacts are cushioned by the dense atmosphere), and some unlike those of any other planet. Because the planet is named for a goddess, astronomers gave all features feminine names--except of course the earlier names of Maxwell and the "alpha" and "beta" highlands.